This week, I made a cake. A cake that takes the cake, if you know what I mean. I found myself in possession of some very disappointing Red Delicious Apples (as all Red Delicious Apples tend to be) that were starting to grow even less appetizing over time. Thus, I went to find my Apple Cake recipe and put them to some use before they morphed into fruit-fly traps on my counter. 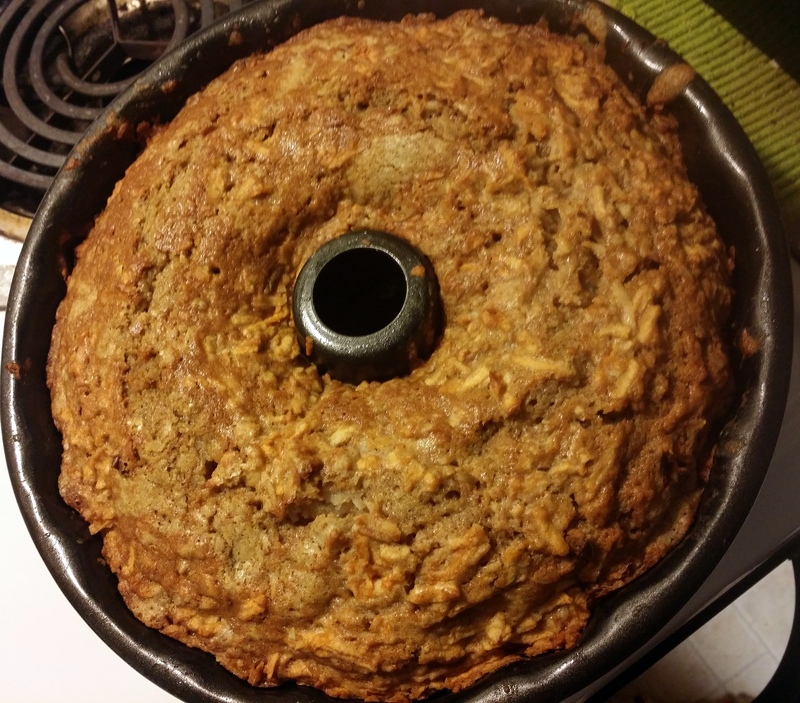 Sadly, I couldn’t find my recipe, but NOT AT ALL sadly, I wound up using one that I found online (somewhat modified) and it might just be my new favorite Apple Cake recipe. The original is from here, but I made just enough changes that I am going to share with you what I wound up making (based on what was in my cupboard) so that you can reproduce the exact apple-y goodness that I was able to mash together, should you so desire (although I’m sure the original recipe is pretty stellar!). 1/2 cup milk mixed with 1 tsp.white vinegar (makeshift buttermilk) – allow this to sit for 5-10 minutes before using! Preheat oven to 325°F and adjust rack to middle position. Stir together sugar, eggs, coconut oil, coconut milk, flour, baking soda, salt, cinnamon and vanilla in a large bowl. Fold in apples and coconut, and then pour the batter into a buttered Bundt pan – the batter was quite thick! Bake for approximately one hour, or until a toothpick inserted near the middle of the cake comes out clean and batter-free! Now, I found that the toothpick was still not quite clean after about an hour, so I increased the temperature to 350°F at that point and baked it for an additional 10-15 minutes and that seemed to do the trick! During the last 15 or so minutes of baking time, pull out a medium-sized sauce-pan and get your carmelly-drenching-glaze ready. 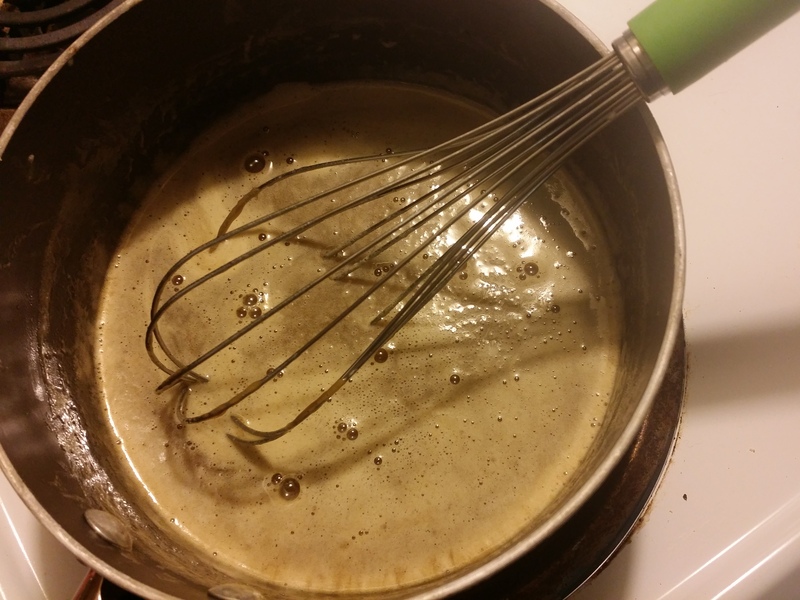 To make the glaze, you put butter, sugar, milk/vinegar mixture (ahem: buttermilk), and baking soda into a medium sauce pan over medium heat, stirring until ingredients are mixed/melted together. Bring to a boil and boil for 1 minute. Stir in vanilla. Immediately after removing cake from oven, pour most of the sauce over hot cake, reserving about 1/2 cup. Let the cake stand for 1 hour, letting the sauce seep into the cake and absorb its magical powers, and then turn it out onto a plate. Pour the reserved sauce over the top. Serve the cake warm or at room temperature. I had a piece that night and it was STUPENDOUS, but when I served the rest of it to friends the next day, the reports were good! It was so moist, but not chunky or overwhelming – just the right blend of Apple and Spice and Caramel (aka. Heaven). « Je Suis . . . Super Sucrée!! !